Georg Holzer, a freelance journalist from Klagenfurt Austria, spoke at TEDxVienna yesterday about a project called pingeb.org he and Bruno Hautzenberger developed. As part of the project they developed an application that makes it easy for people to develop QR codes and NFC transponders. They used the system last summer to distribute free books in Klagenfurt and realized that it could also be used to showcase local musical artists as well as many other things. 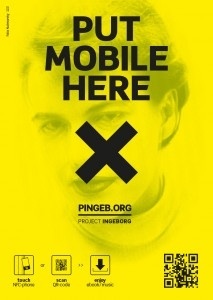 Check the pingeb.org to see how it works. The application allows you to print QR codes that link to your website. There you can provide information, they are using it to showcase one musical artist a week in Klagenfurt, with links to download songs etc. The cool thing is that you can change the page the QR code refers to – this means that you don’t need to replace all the QR codes when you want to link to another page.